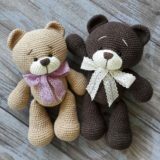 Free crochet plush pattern to make a sweet teddy bear in dress. 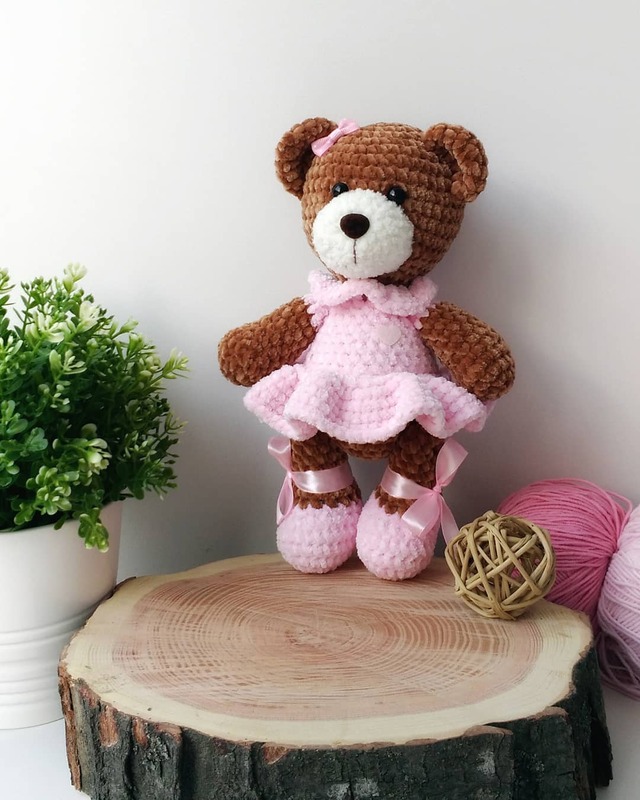 Make your own adorable amigurumi bear, take your favorite colour for the dress.
! Better to sew details to each other with other yarn not with plush yarn. Insert eyes between R 9 and R 10 at the distance of 4-5 st from each other. F.o., leaving a tail for sewing. Insert the nose between R 3 and R 4. Go to the body R 9. 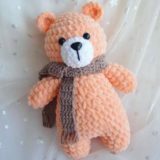 Decorate your bear with satin ribbon. Keitha, the designer has shared only this pattern. Did you get the pattern for the collar? Where did you find the tutorial? 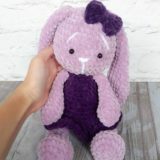 I agree-cute pattern but poor directions and I also could not find any tutorial. Would it still take 1 skein if I wanted to use 1 main color (instead of 2 colors like the pink and brown)?? How do you use a 4.5 crochet hook with #6 bulky yarn? 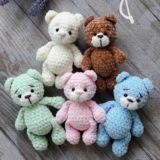 Doreen, you can use 4.5-6.00 mm crochet hook for a plush yarn. I agree that this is a great bear. Plus I am also disappointed that I could not print the pattern. I do a lot of travelling and it is a good time for knitting but I can’t carry my computer around wherever I go. Valerie, use Ctrl + P.
Where do I attach the ears? Love the pattern but didn’t see any instructions for the collar. 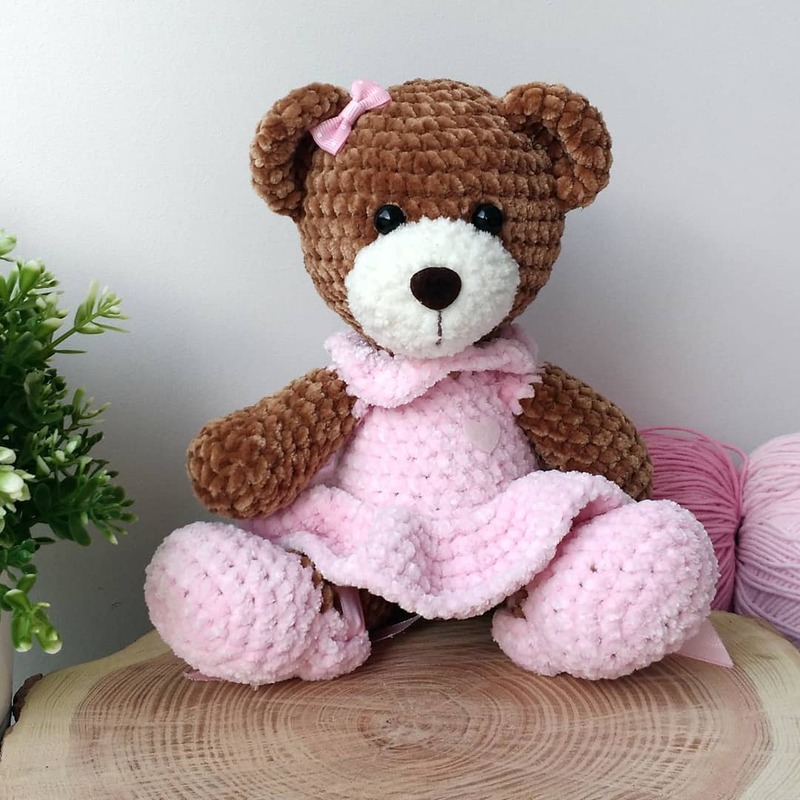 How do I know if I am to crochet in rounds or rows? Nadine, amigurumi toys are crocheting in a spiral. The continuous round requires no chaining at the start or slip stitching to join and complete rounds. Crochet continuously in a spiral, if it isn’t written other (some patterns will need you to join rounds). What r the instructions for the collar they seem to missing?